You’re probably shooting events with 1 or 2 cameras. Consequently, you risk missing key shots or having to decline more complex multi-cam projects. Now, you can record events with up to 4 cameras—using as few as 1 or 2 crew members—and do so with live switching & live streaming as you create an instant line-cut for your NLE. If you’re contemplating multi-camera production—or doing it without a multi-channel recording system—V-Station HD will matter to you! Our new V-Station HD Producer4 series Multi-Channel Video Recorder/Switcher/Streamer (4S) Package, and your cameras —along with your Windows PC (Desktop, laptop or Surface Pro tablet)—makes it easy. 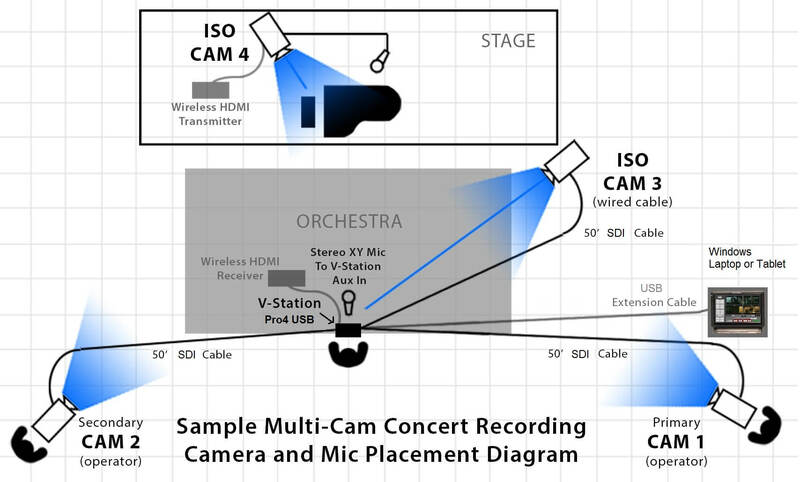 And, with 4 channels of simultaneous 1080p30 recording, you’ll have all the camera angles captured. You'll be able to adjust any of the line-cuts in post to get the exact action cut you seek. Typical V-Station HD Producer4 setup for a 4-camera shoot using 2 stationary (ISO) cameras, and 2 operator controlled cameras. A low-cost wireless HDMI transmitter can be ideal for the 4th ISO cam. * In addition, the 4th source video can be from another PC via VGA or DVI, or even a S-Video or Composite video source. For a limited time, Reserve your V-Station HD Producer4 Multi-channel Video Recorder, Switching & Streaming Package and SAVE $200 off the $2495.00 price! Plus, we’ll provide FREE SHIPPING*! * Currently free shipping only to USA destinations.